Up for your consideration is this adorable Fall / Winter / Holiday coat set by Bonnie Jean. 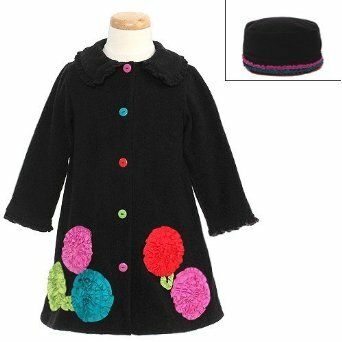 This solid black fleece coat features multi-color button details down the center, snap front closure, peter pan collar, ruffled trims at the end of the sleeves and around the collar, multi-color bonaz 'flower' decoration at the bottom, and comes with a matching round hat with multi-color rushing around the bottom. Note: The hat is more shallow than what the stock photo shows. It is about 3 1/2 inches tall. Your little one will look so stylish in this terrific coat set. Coat & hat are 100% polyester. Bonnie Jean is a great brand sold in high end department stores.